As a former federal prosecutor and, currently, as an Augusta, Georgia criminal defense lawyer, I love books and movies about courtrooms and crime. What is your favorite movie about white collar crime? Some of mine include: The Firm, starring Tom Cruise, Silkwood, starring Meryl Streep, and A Civil Action, starring John Travolta. But after this weekend, if the critics are correct, I may be updating my personal list of favorites with a new David O. Russell film, called American Hustle. This new white collar crime movie has everything, including good directing, good acting, (with Christian Bale and Jennifer Lawrence, among others), and, apparently, a good, fast-paced script! The film reportedly focuses on the F.B.I. 's use of a two-bit con artist to pull a sting on some crooked politicians! Speaking of stings, that reminds me of another one of my favorite movies about white collar crime: The Sting, which starred Paul Newman and Robert Redford! 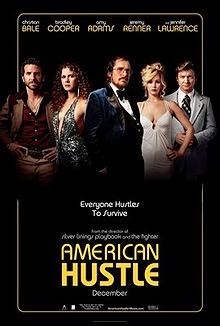 Here's hoping that American Hustle lives up to its billing and that it becomes one of our all-time favorite movies about white collar crime! Again, what are some of your favorites?